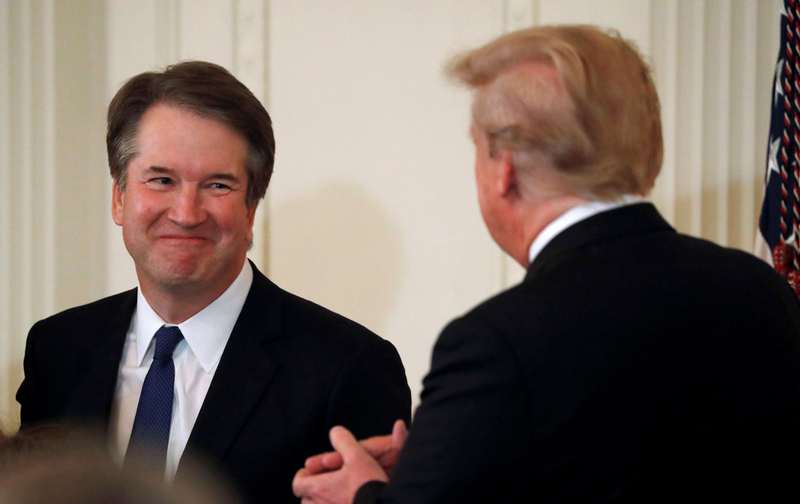 Last night, in primetime, President Trump nominated Brett M. Kavanaugh to become the next Associate Justice of the U.S. Supreme Court. If approved by the Senate, he would replace Justice Anthony Kennedy, who is scheduled to retire at the end of the month. The President, a man not known for constancy or predictability, did exactly what he had been promising since his 2016 campaign: he nominated a widely respected judge with a firm, proven conservative record. Kavanaugh, 53, has been a judge on the US Court of Appeals for the DC Circuit since 2006. A graduate of Yale Law School, he, like Trump’s last nominee, Neil Gorsuch, clerked at the Supreme Court for Justice Kennedy. After a stint in private practice, Kavanaugh worked for independent counsel Kenneth Starr during his investigation of President Clinton, which eventually led to Clinton’s impeachment. He advocated on George W. Bush’s behalf during the Florida recount saga in 2000, then he landed a job in the Bush Administration, first as an attorney in the White House Counsel’s office and then as the President’s staff secretary. Bush nominated him to the DC Circuit in 2003. After Democrats stalled the nomination for several years, he was eventually approved in the Senate in 2006 by a vote of 57 to 36. Judge Kavanaugh’s hundreds of written opinions establish him as a solid judicial conservative—as well as a strong, clear writer. He has given interviews, delivered speeches, and written law review articles in which he elaborated on his judicial commitments. All of these, along with piles of documents from his time in the Bush Administration, will be carefully reviewed by friends and foes in the coming months. Most all people who have worked with him—colleagues, clerks, students—say he’s a friendly, generous, and caring person. We’ll be sure to hear a lot more about Kavanaugh’s character as his supporters go to work building the case for his nomination. Previous PostJustice Kennedy’s Retirement: Reactions and RetrospectivesNext PostWhat Now in the Confirmation Process?